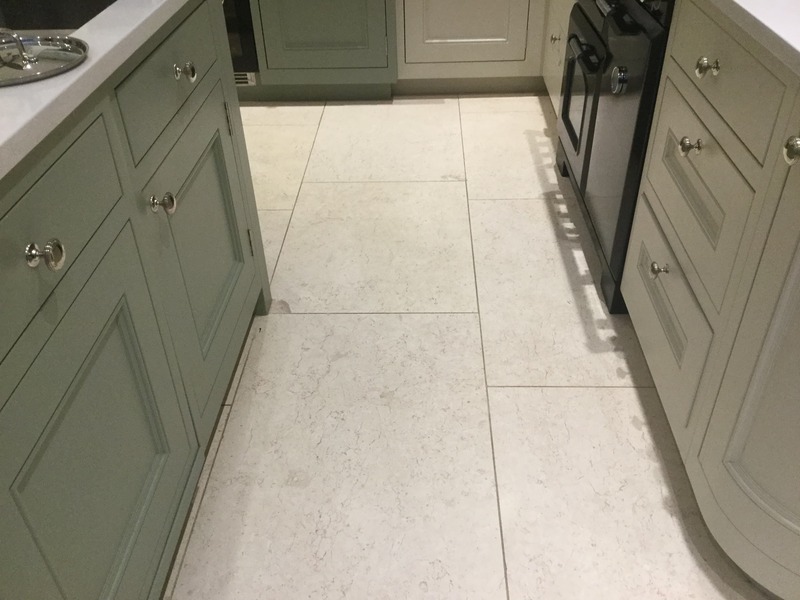 This Limestone kitchen floor in Shepperton was laid new 3 years ago when a new kitchen was installed. 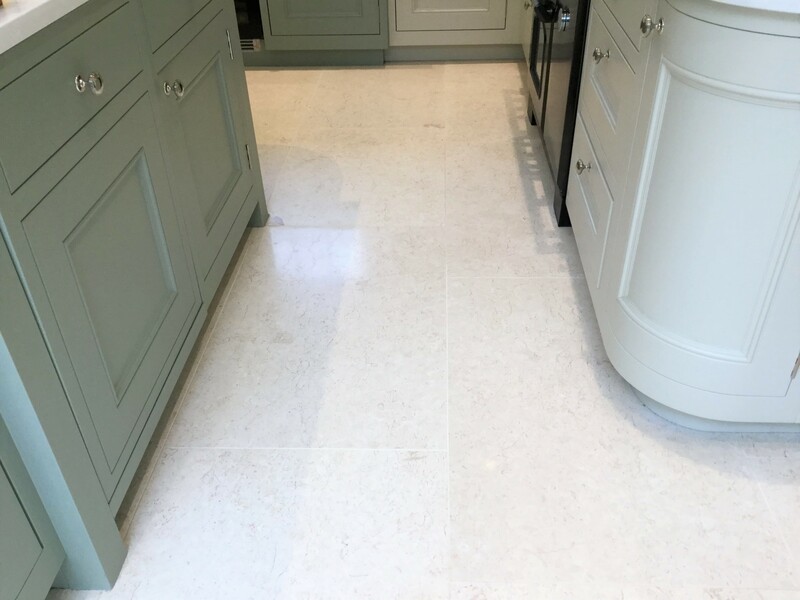 The client had called in despair as the floor was just not looking its’ best and they were trying hard to get it clean, using household cleaners which were having no effect. I’m actually based in Shepperton, so it wasn’t long before I was able to pop round and survey the floor. The town has a lot of history and is famous for nearby Shepperton Studios which were built on the grounds of Littleton Park, many famous films have been created here including Attenborough’s Gandhi (1982) and David Lean’s A Passage to India (1984). As you can see from the pictures, the soil had penetrated the stone as the sealer had broken down over time. The grout lines were particularly bad but also, the small veins and pores had accumulated dirt, mainly due to pets and kids coming in from the garden. It’s worth noting that the use of supermarket cleaning products will have escalated the decline of the sealer, most are simply too strong for sealed surfaces and you should always read the label to ensure its suitable before using it on your floor. This problem is quite common, and the solution is straight forward. Restoring the look of the floor requires removing the soiling with a deep clean and then when the floor is dry apply a new sealer to protect it. I talked the process over with the customer and agreed a quotation for completing the work which was accepted and arranged a convenient date. The work would be carried out over two days. 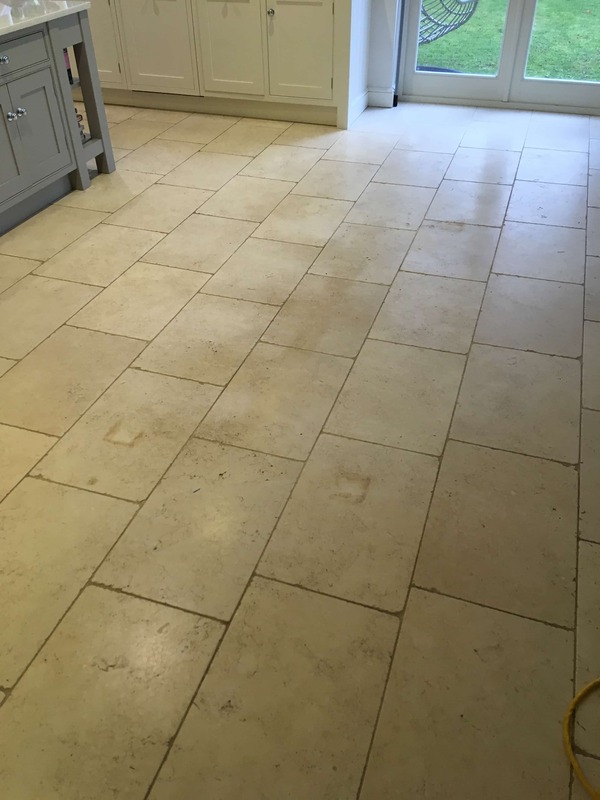 A strong dilution of Tile Doctor Pro-Clean was sprayed on to the floor and after leaving it to soak in for about ten minutes, we mechanically scrubbed the solution into the Limestone using a rotary floor buffer fitted with a black scrubbing pad. The pads can struggle to reach into the recessed grout however to that was manually scrubbed using more Pro-Clean. This process broke down the soil and released it from the stone and grout. Following this, we used a low-pressure rinsing machine and vacuumed all the soil and remaining cleaning product away from the floor. Whilst I was working on the floor, I got the shock of my life as a bird hit the kitchen window resulting in a loud bang. 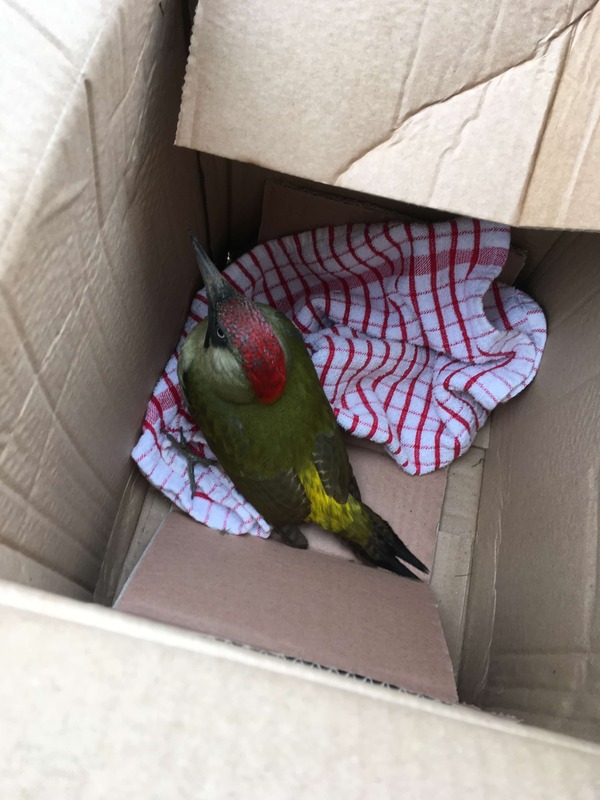 I rushed outside to find a beautiful Green Woodpecker lying dazed on the floor, the poor thing had knocked itself unconscious. I put him in a cardboard box until he eventually recovered and flew off. I guess being able to drill into trees makes Woodpeckers tough birds who can withstand a knock or two. In this job no two days are the same, you never know what’s going to happen! After allowing 24 hours for the floor to dry, we returned the following morning to apply a new seal. The best sealer for this type of stone is Tile Doctor Colour Grow. It is a colour enhancing impregnator that soaks into the pores of the stone protecting it from within whilst enhancing the natural colours in the process. Impregnating sealers work by occupying the pores in the stone thus preventing dirt from becoming ingrained there. 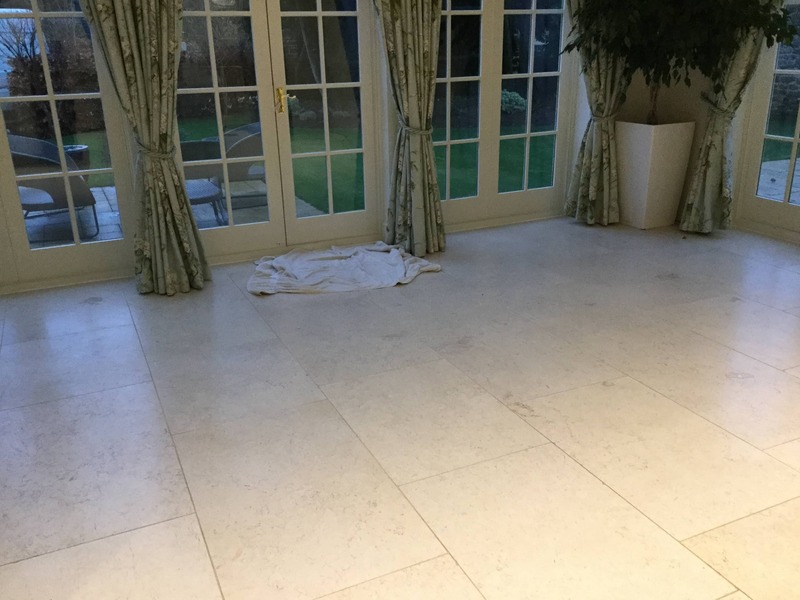 The client was delighted with the floor which now looked cleaner and fresher. We had managed to restore it back to it looking as it did when it was new, and the new sealer will keep it looking that way for some time to come. 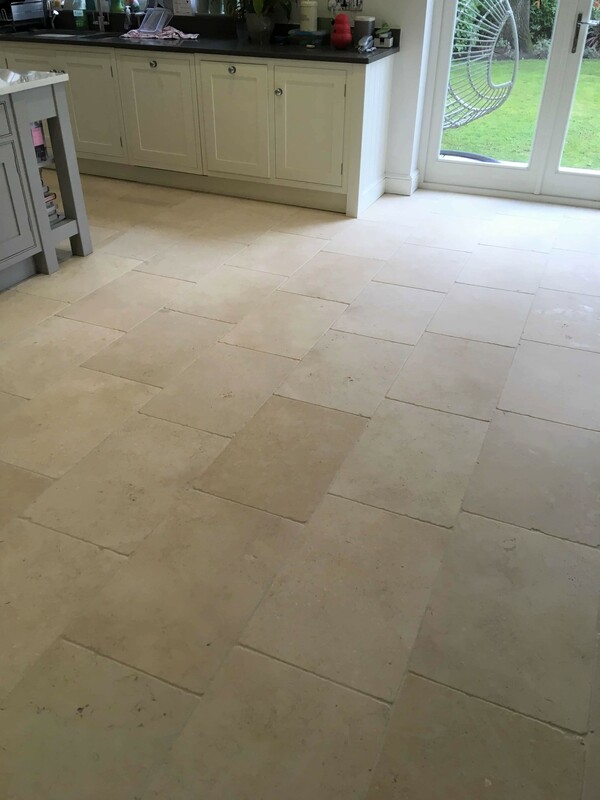 I was contacted by the owner of a property in the picturesque village of Ecton who was concerned that her Limestone floor spanning the kitchen and open plan breakfast area was starting to lose its natural appeal and was finding it harder to clean and maintain. I went over to take a closer look at the floor and carry out a survey. In order determine the best cleaning method I conducted a test on a small area of the floor. This gives the clients confidence in my abilities and a good idea of what result we they can expect. 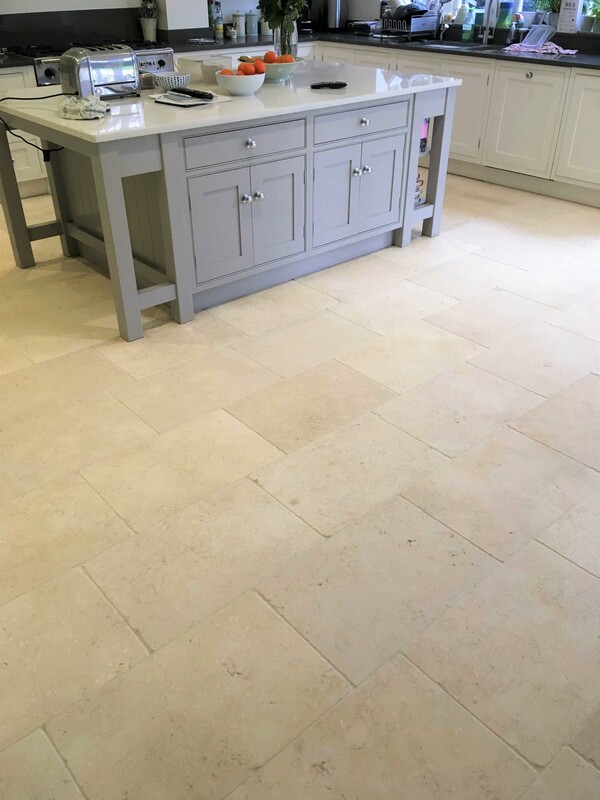 The Limestone was honed smooth but was not polished and the customers were keen not to add too much of an unnatural shine to the floor. The grout lines in some of the more heavily used areas, such as by the sink, were also discoloured and would require a decent scrub with an appropriate cleaning product. I spoke to the clients about options for the finish to be applied after cleaning and they decided that they wanted to keep the tiles as light as possible with a slight shine. With the clients impressed with the test area I prepared I went away and produced a detailed quote which was e mailed to them along with our general T&Cs and the work was booked in to be completed shortly after. The floor covered quite a large area, some 38m2, and had some larger items of furniture that needed to be moved before starting. The first task was to scrub the grout lines with a specialist grout brush, designed to work the product into the grout. 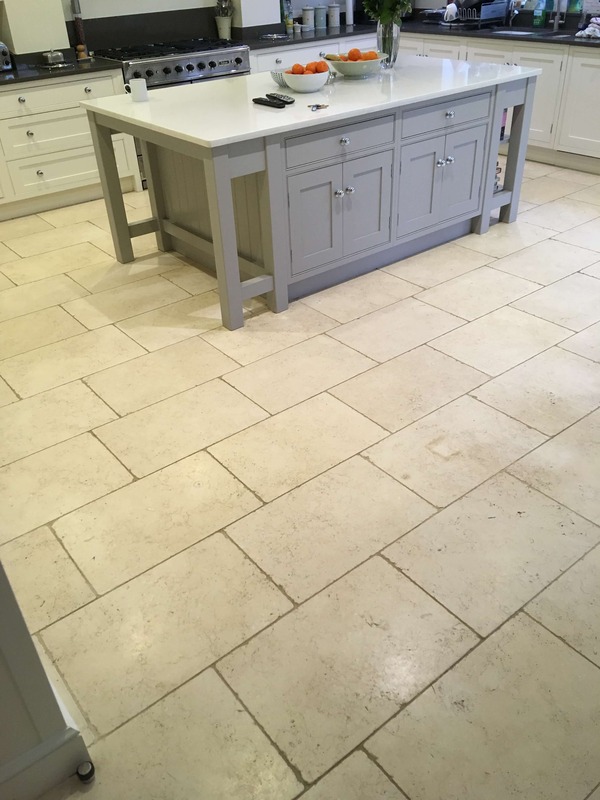 Limestone is an acid-sensitive stone, so a strong alkaline cleaner was required. I used Tile Doctor Pro-Clean mixed with warm water at a ratio of 3:1 which was left to dwell for around twenty minutes. The area was then rinsed with water and the soil extracted before applying a series of diamond impregnated burnishing pads attached to a rotary scrubbing machine, ranging from a coarse 400 grit (200 in some of the more stubborn areas), a medium 800-grit and finishing with a fine 1500 grit to clean the stone. The whole area was then rinsed again and extracted using a wet pick up vacuum. The floor was then left to dry overnight. The following day a very fine 3000 grit diamond pad was used to ‘spray burnish’ the floor which uses very little water and ensures that any remaining residues are lifted as well as finishing the floor in the highest level of mechanical polishing possible prior to sealing. If the clients desired a higher level of shine a powdered high shine sealer would have been worked into the tiles to achieve a highly reflective surface, however the mechanical polish was the highest level of shine wanted. 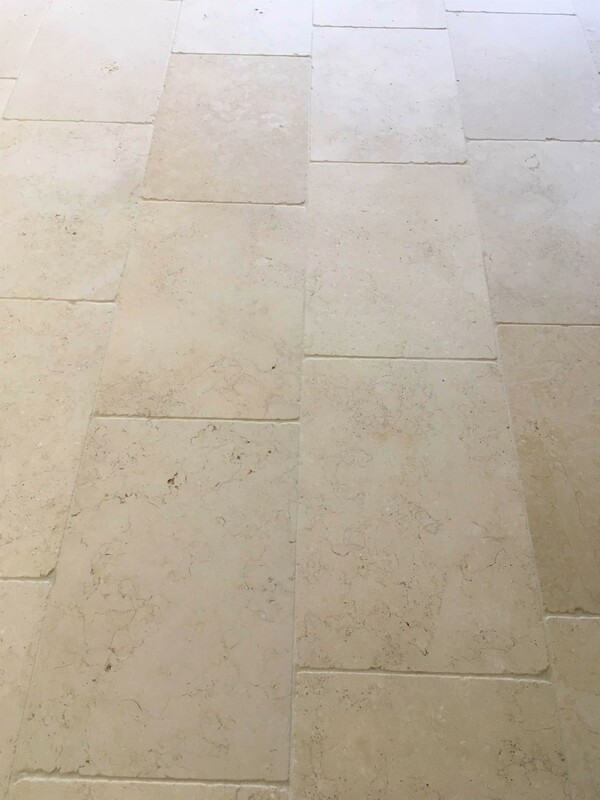 My client requested a completely natural finish so to seal the stone after cleaning I applied an impregnating sealer called Tile Doctor Ultra Seal. 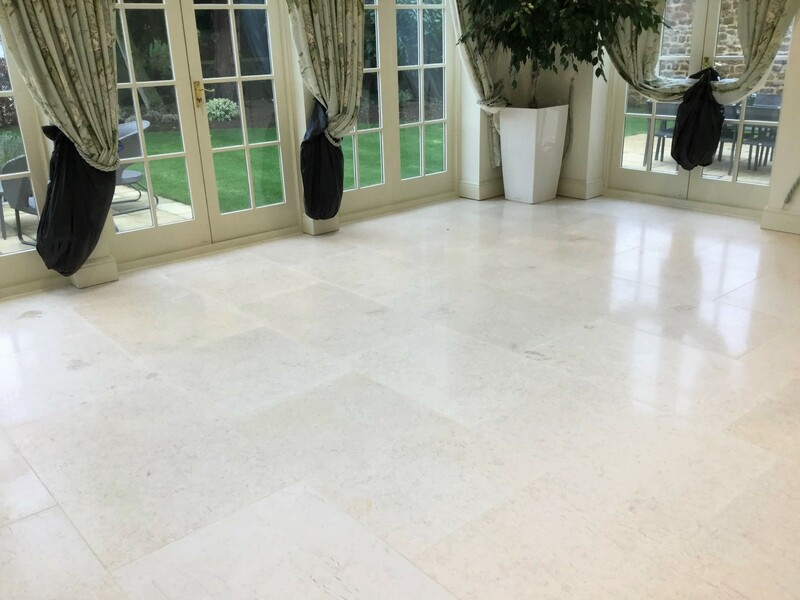 Impregnating sealers soak into the pores of the tile protecting them from within and Ultra-Seal doesn’t alter the appearance of the floor and so maintained the natural appearance of the stone keeping it as light as possible. Aftercare instructions along with a bottle of suitable pH Neutral Tile Cleaner were supplied. 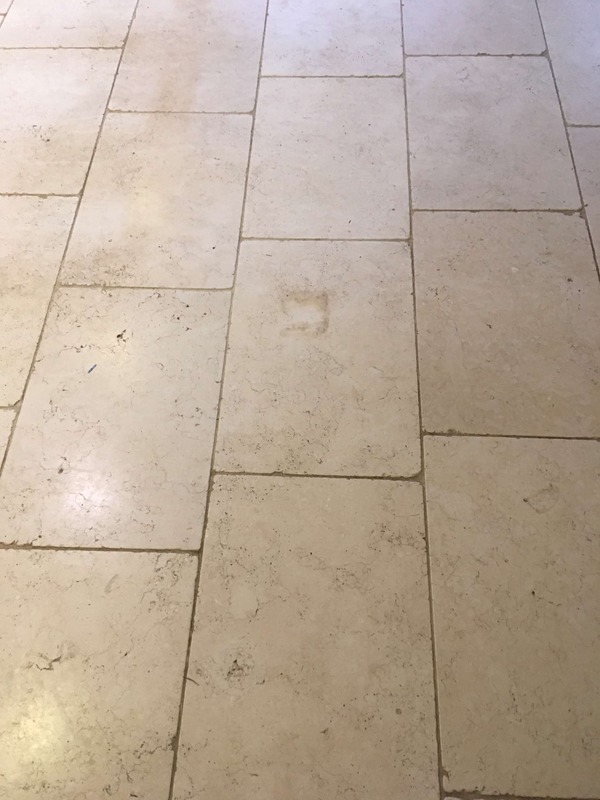 The customer was thrilled with the result and was surprised at the transformation of the floor, they even left the following feedback on the Tile Doctor website.